The Great Alpine Road, a 308-kilometre route from Wangaratta through Mount Hotham and Dinner Plain to Bairnsdale, is an extraordinary drive at any time of year (chains must be carried during the winter months). It packs a powerful scenic punch, taking you past valleys, mountains, forests, rivers, vineyards, farms and historic villages before arriving at Bairnsdale, near the ocean, in Gippsland. While this route can be covered easily in a day, you’d miss out on a great deal of countryside if you don’t take the Discovery Route loops. For example from Dinner Plain head through farming country of Cobungra to Omeo - Anglers Rest- Falls Creek-Mount Beauty - Harriettville - Mount Hotham- returning to Dinner Plain during the summer months Or head to the Valleys to Mount Hotham - Harrietville Bright and onto Mount Buffalo drive takes you from Bright-Porepunkah-Mount Buffalo-Porepunkah and back to Bright. It’s the best way to ensure you see the Mount Buffalo National Park on your travels. Alternatively leave Bright for the nearby heritage-listed village of Wandiligong, before heading back toward Harrietville, Mount Hotham, Dinner Plain and Omeo. Want a challenge? Then try the tight curves on the iconic Great Alpine Road to Mount Hotham, the Mount Beauty-Falls Creek alpine road and the steep road that winds up to Mount Buffalo. (Roads are not suitable for motorbikes from June to October and extreme caution at all times due to sudden weather changes). If you’re in cruise mode, a loop around the region will give you straight stretches of road along the Great Alpine Road and Kiewa Valley Highway, with some good bends on the roads between Happy Valley, Mount Beauty, Tawonga and Bright. The Great Alpine Road is also included in the new Sydney to Melbourne Touring Routes. It’s one of three distinctive touring routes that take you between Australia’s two largest cities. 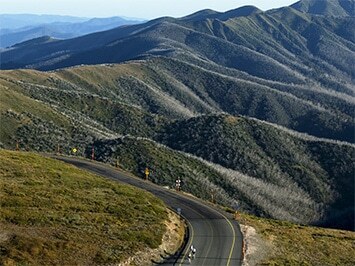 The ‘Adventure’ route drive takes you over the stunning Victorian Alps. Drive Australia’s highest year-round accessible sealed road up lofty mountains, into valleys and past rivers and vineyards to the ocean. Along the way have an outdoor adventure - experience rock climbing, hang-gliding or white-water rafting and snow sports in winter. Sample gourmet delights at welcoming towns along the way. Dinner Plain has a 10 kilometre track the 'Dinner Plain 4WD Track' from the Birregun Road to the Great Alpine Road. This is a moderately graded track, with a few rocky sections toward the top.